This is what has been on my news channel for the past 2 hours. 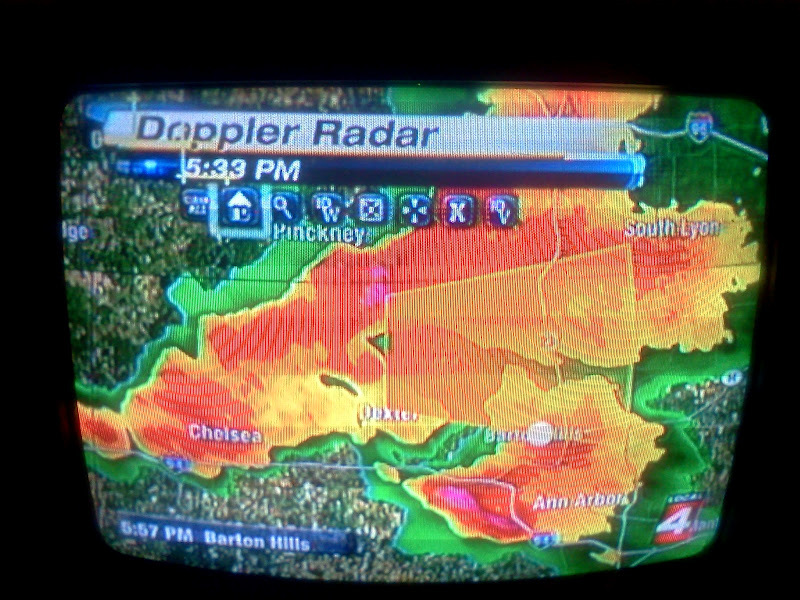 For a time we were under a tornado warning in town. There was a touchdown of a tornado about 20 miles to the southeast of where I live. There has been some damage from wind and golf ball size hail in that area, but so far no reports of injuries. For a time it looked like the storm was heading directly to my town, when it suddenly shifted to the south. I had my kids and most of the pets in the basement for a good hour. The portable furry pets like the cats and hamster were able to take shelter with the kids, but poor lizards and turtle are not really able to move with their large cages. Now that the excitement is over, we need to start the homework and figure out what to do for dinner. UPDATE... There is currently live video on the news. Several houses and businesses were completely destroyed... 3-4 inches of water is being reported in Ann Arbor. They are thinking it is most likely an EF-2 that went through which is 111-135 mph. Praying for all that have been affected.